You might say the theme of the day is mythological creatures. Except, the creatures in question aren't quite like those you've heard or read about in Greek mythology (i.e. centaurs and minotaurs). No, these are something else entirely. One is half-man, half-goat and based on a local legend surrounding the Goatman of White Rock Lake. The other, a sort of glimpse into what might happen in a movie called Godzilla Meets the Gourd. Individually, they represent limited edition brews from Lakewood and Deep Ellum, respectively. Together, we'll call them creatures of the craft beer kind. I know that "spokesthing" isn't a word, but I'm not sure how else to refer to the pumpkin-headed reptile Deep Ellum has trotted out with their newest seasonal brew, Gourdzilla. Based on how the thing looks, and its antics in an introductory video, it would be only natural to expect Gourdzilla to be a beast of a beer. Ah, but looks can be deceiving. Gourdzilla is the first beer from Deep Ellum's newly hired brewing team of Jeremy Hunt and David Hauptman. And the truth is it's actually pretty...nice. Delicate even. It's got wisps of smoke, pumpkin spice, earthy sweet potato and maybe a hint of tannic bitterness. Flavors are mild, well-balanced and the beer is about as easy drinking as it can be. Not what you expected to hear, is it? Imagine that, a pumpkin and spice beer that doesn't hit you over the head with pumpkin and spice. Right about the time you raise your glass for that one last sip, it hits you. If Temptress had a long lost brother who grew up on the wrong side of the tracks, he'd be a lot like Goatman. He's a little grittier, not as sweet, and he's obviously hopped up on something. Throw in the legend of him being an ill-tempered, trash-tossing terror, with the obvious "Beauty and the Beast" reference and it all just fits. Strictly speaking, the only thing these siblings have in common is a taste of dark chocolate, as there are a handful of ingredients that set them apart. Lactose sugar makes Temptress sweeter, while Goatman brings more roasted malt to the fore (the grittier part, if you will) and is dry-hopped with Simcoe to give it a dank, resinous hop character. As for the chocolate, it's not nearly as intense in Goatman as it is in Temptress, but it's definitely there. Goatman is the third release in Lakewood's Legendary Series, and is billed as a cross between an Imperial IPA and a schwarzbier. It's a lager, as opposed to an ale, but that shouldn't be construed to imply a lack of flavor. There may not be any esters, but there's enough of everything else that you probably won't even notice. Look for both on tap and in 22 oz bottles. Having attended the Great American Beer Festival (GABF) three years running, it seems clear that the craft beer boom shows no signs of waning. Tickets numbering 49,000 sold out in a mere 20 minutes, and the number of brewers entering the competition was greater than ever before. A total of 4809 entries from 732 breweries were judged, resulting in 252 medals being awarded overall. Ten of these went to breweries from Texas (summarized at the bottom of the page), with local brewers Community and Cedar Creek bringing home gold medals for their ESB and Belgian-style Dubbel respectively. In terms of trends, American-style IPAs and Imperial IPAs continue to be among the leaders in number of entries, along with wood and barrel-aged brews. Herb and spice beers were also near the top of the list, though this category actually saw a reduction in entries compared to a year ago. If there was one surprise, sour categories didn't experience a great deal of growth despite their obvious popularity. The latter evidenced by an abundance of traffic at brewery booths offering a walk on the wild side. Another interesting side note was the sheer number of beers I tried featuring Colorado-grown barley and hops, not to mention a few which included (among other things) locally harvested juniper boughs and spruce tips. 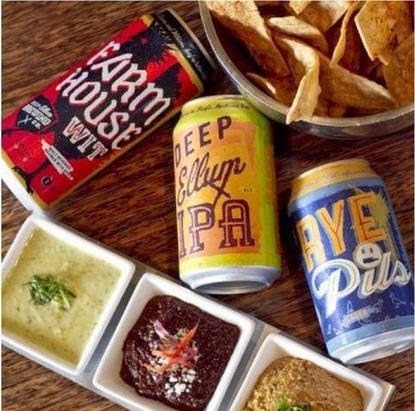 Here in Texas, barley and hops are obtained from outside the state, leaving water, yeast (a la Jester King) and specialty ingredients (like honey) to be our primary forms of terroir. A trip to the Denver Beer Company for their Collaboration Celebration was at the top of my list of things to do outside of the festival. Why? One of the featured beers was a Coffee Stout brewed in collaboration with Rahr & Sons. This brew had a nice, balanced flavor profile revealing hints of chocolate and roast, eventually finishing with a raw coffee bite. I figure that if you're going to write about beer, you have to be willing to try anything, no matter what it looks like, smells like, or what ingredients go into making it. The same thing goes for judging beer, something I'm pretty sure it says almost verbatim in the manual. 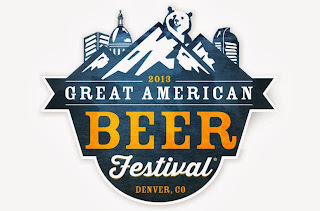 Last year, a subject heading of this type would have featured Wynkoop's Rocky Mountain Oyster Stout, which turned out to be a by-the-book dry stout that just happened to be brewed with bull testicles. 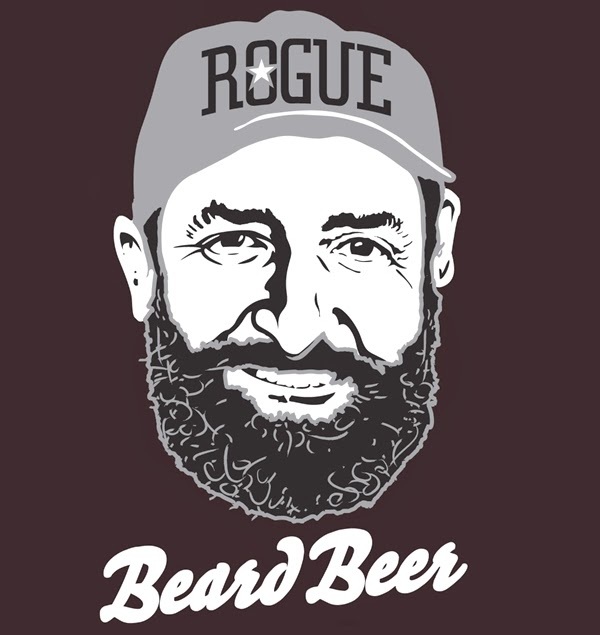 This time around, the concoction in question is The Beard Beer from Rogue, a brew created with yeast extracted from Brewmaster John Maier's beard. It sounds a little out there, but the resulting beer is pretty benign. It's classified as an American Wild Ale, which seems appropriate, but its character was more earthy than funky to my taste. Basically, it's a straightforward Belgian-style pale ale. And no, I didn't get any hair stuck in my teeth. Rabbit Hole (on track for a November opening) recently announced they will release a beer created in association with Dallas Stars future Hall-of-Famer Mike Modano. 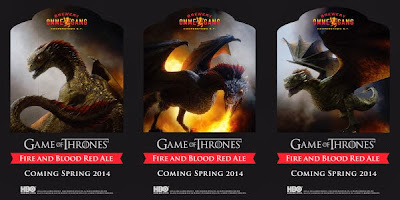 Celebrity and athlete collaborations are still relatively new to the world of craft beer, but we've already seen some successful endeavors with Iron Maiden's Trooper Beer and the HBO/Ommegang Game of Thrones series. 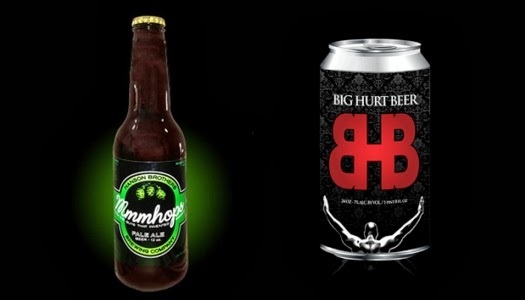 Curious how other, similar concepts have turned out I decided to track down MMMhops, a joint venture between the band Hanson and Oklahoma's Mustang Brewing Company, and Big Hurt Beer, brewed by the Minhas Craft Brewery in Wisconsin for former Chicago White Sox slugger Frank Thomas. MMMhops comes across as a basic American-style pale ale. While it's not a bad beer, it's fairly uninspiring and I imagine more than a few people's response to it would be MMMeh. As for Big Hurt Beer, here's a product that will probably illicit a much less measured response. It's categorized as a malt liquor by both Ratebeer and Beer Advocate, which fits right in with the "imperial light lager?" comment I jotted down in my notes. What's the expression? If you can't say something nice, don't say anything at all? Let's roll with that on this beer. As for Big Hurt MVP, the "premium" version of this strong lager, when I asked a volunteer what was different about it he replied through a somewhat pained expression, "Man, it MIGHT be a little sweeter." Message received, moving on. Dogfish Head American Beauty: Referred to as a counterculture collaboration with the Grateful Dead, this beer is brewed with and tastes a lot like the ingredients in a granola bar (honey, oats, grains). It's scheduled to launch at the Alamo Drafthouse Cinema in Richardson on October 22, where they'll be screening The Grateful Dead Movie. Shiner White Wing: A Belgian-style wheat ale brewed with coriander and orange peel, it's expected to be released later this year. Ommegang Game of Thrones Fire and Blood Red Ale: Inspired by House Targaryen (a noble family on the show), the latest brew created in collaboration with HBO will be released in the spring of 2014. No details related to the beer itself, as only a sneak peak at the label artwork was revealed. 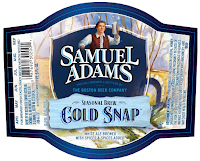 Samuel Adams Cold Snap White Ale: The brewery's new spring seasonal (replacing Alpine Spring) was revealed at a media brunch on Friday. It will be a Belgian-style witbier brewed with spices. Look for it in the January-to-March time frame. Seeing as how GABF sessions are at night, you have to find something to do with your days. As you might imagine, breweries are opening at a breakneck pace in and around Denver. What follows are thoughts on those that I visited. Avery, Boulder- The only brewery on my itinerary that currently distributes to Texas, your impression of them might differ from the locals. While some identify them more by their Demon or Dictator Series (i.e. big beers), conversations in the taproom center around what constitutes the quintessential Avery sour. Crooked Stave, Denver - Located outside the immediate downtown area, Crooked Stave recently moved to The Source, a sort of artisan outpost complete with restaurants, a bakery, meat market and coffee house. Elbow room can be at a premium given the small-scale digs, but the beer is worth it. Comparable to Jester King in terms of creativity and their style portfolio. Equinox, Fort Collins - Based on the recommendation of no fewer than four industry people, I visited this hole-in-the-wall brewery and taproom off the main drag in Fort Collins. Their most interesting offering was a Finnish-style sahti called The Knotty Bough, brewed with juniper berries and fermented with a Bavarian hefeweizen yeast. Funkwerks, Fort Collins - Located to the east of the Fort Collins city center, Funkwerks is a saison-focused brewery that may also draw comparisons to Jester King. They don't offer flights, though you can build your own by way of a series of half-size pours into what looked to be a 20 oz snifter. Odell, Fort Collins - What was once little more than a shack when I first visited it ten years ago, Odell has expanded to the point of being a bustling beer mecca. Long-rumored to be headed to Texas, should that happen (next year at the earliest) their Mountain Standard Double Black IPA will take up permanent residence in my refrigerator. Prost, Denver - Take away the taproom and some of the old world brewing equipment and you might swear you were visiting our own Franconia Brewing Company. Classic German styles adhering to the Reinheitsgebot are the order of the day here, some brewed on 50-year old copper kettles brought in from the old country. Black Star Co-op Pub and Brewery, Austin: Elba, Bronze for Herb and Spice Beer. Cedar Creek Brewery, Seven Points: Belgian-Style Dubbel, Gold for Belgian-Style Abbey Ale. Namaste Brewing at the Whip In, Austin: Bitterama, Gold for Herb and Spice Beer. Pinthouse Pizza, Austin: Blind Jake, Bronze for Brown Porter. Saint Arnold Brewing Company, Houston: Summer Pils, Silver for Munich-Style Helles; Weedwacker, Bronze for German-Style Wheat Ale. Austin Beerworks, Austin: Black Thunder, Gold for German-Style Schwarzbier. Community Beer Company, Dallas: Public Ale, Gold for Extra Special Bitter. Real Ale Brewing Company, Blanco: Brewers Cut Altbier, Silver for German-Style Altbier. Jester King Brewery, Austin: Atrial Rubicite, Bronze for Belgian-Style Lambic or Sour Ale. Five years ago, the very idea of a beer festival focusing on Texas brands seemed unimaginable. There just wasn't enough beer. Outside of the Austin area, which was home to Real Ale and a handful of others, the only additions to the roster of Texas breweries were Saint Arnold and Southern Star in Houston, along with Rahr and Franconia here at home. Needless to say, keeping track of what was happening in the local or statewide brewing industry didn't take up a significant amount of time. Today, it's a whole different ballgame. In the Metroplex alone, over the course of the last 24 months we've gone from 2 local brands to 14, which translates to a growth rate of 600%. 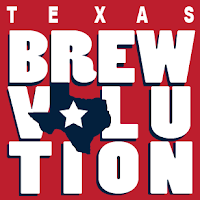 Combine those numbers with similar expansion in other cities, and you'll find there are more than 60 production breweries currently active in the Lone Star State. Suddenly, talk of a beer festival focusing on Texas brands becomes a much more interesting conversation. For years, folks in and around Austin have enjoyed just such an event in the form of the Texas Craft Brewers Festival. Now, thanks to those behind Paste Untapped and the Big Texas Beer Fest, North Texans will have a similar experience all their own. Served alongside all of this local flavor will be a handful of products from some of the best breweries around the world. According to Chad Montgomery of Big Texas Beer Fest, the ability to deliver world-class brands comes from working "very hard to maintain great relationships with breweries and distributors by putting on great events, as [they] are becoming more selective on who they choose to work with." Additional attractions include live music from Shotgun Friday, the Hanna Barbarians and the Roomsounds, as well as a selection of local artisan food and craft vendors. Tickets are available by way of Eventbrite at a cost of $35 for general admission, or $60 for VIP. Benefits of the latter include early entry at 1 p.m., first access to festival rarities and in-and-out privileges for the day. Visit the festival website at www.texasbrewvolution.com for more information. You can also stay up to date by following developments on Facebook and Twitter. 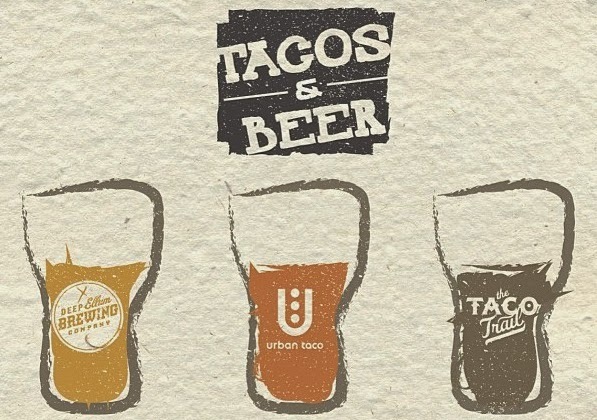 Image credit: Deep Ellum Brewing Company, Urban Taco, The Taco Trail. What's the first thing that comes to mind when someone says tacos and beer? Mystery meat, crunchy shells and a Corona? As narrow minded as that sounds, given beer's reputation as a lowbrow libation, for some it's probably not that far from the truth. So, how to go about altering such perceptions? One way might be to call upon a taco blogger, a local craft brewery, and a popular uptown taquería to help put such notions to rest. A Wednesday night affair called Tacos & Beer, the combined effort of Taco Trail, Deep Ellum Brewing Company (DEBC) and host Urban Taco, sought to do just that. The menu featured a five-course meal served alongside six Deep Ellum brews, one of which was created especially for the occasion. Pairings offered a good mix of contrasting and complimentary flavors, though even in cases of extreme contrast there were still elements that helped to bring it all together. Take the coupling of the Double Brown Stout Barbacoa Taco with Dallas Blonde. At first glance, DEBC's Double Brown Stout would seem be the natural choice, but that might have proven to be a bit much. 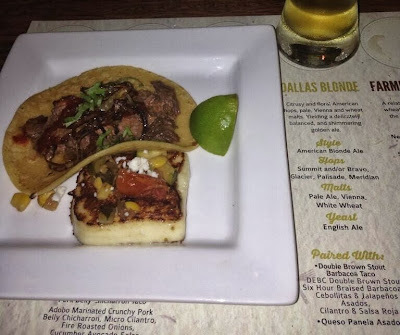 Instead, the bright and hoppy Dallas Blonde offset the richness of the barbacoa, with the cilantro and the beer's citrusy character providing an element of familiarity. Among the best complimentary pairings were the Jalapeño Zucchini Salsa with the earthy, peppery Farmhouse Wit, and the evening's grand finale, which brought together a chocolate-covered churro doughnut and The Holy Mole Brew. 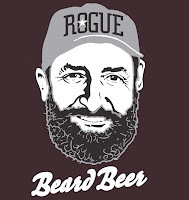 This beer, which debuted at this event, was a version of the brewery's Double Brown Stout cask-conditioned with guajillo, ancho and mulato chili peppers, Nestlé Abuelita Mexican Chocolate and Mexican Coca-Cola. Deep Ellum owner John Reardon readily agreed it would have benefited from a little more carbonation, but it was still an enjoyable brew with a nice balance of sweet and spice, seemingly lighter in body than the original. As for the rest of the menu, it's provided for your reading and viewing pleasure below. 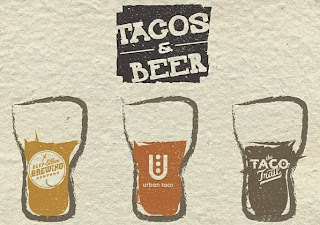 Inedible imagery provided by Urban Taco and Matt Dixon of Dallas Brew Scene. Course 1: Chips and Salsa Beer Trio. Course 2: Double Brown Stout Barbacoa Taco and a side of Queso Panela Asado, paired with Dallas Blonde. and jalapeños asados (grilled green onions and peppers), cilantro and Salsa Roja. 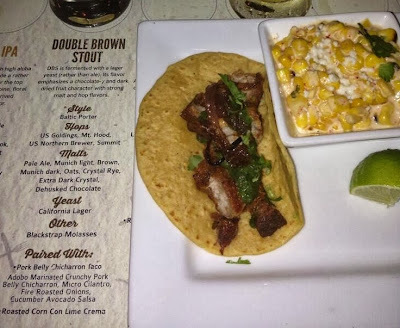 Course 3: Pork Belly Chicharrón Taco and a side of Roasted Corn con Lima Crema, paired with Double Brown Stout. micro cilantro, fire roasted onions and a cucumber avocado salsa. 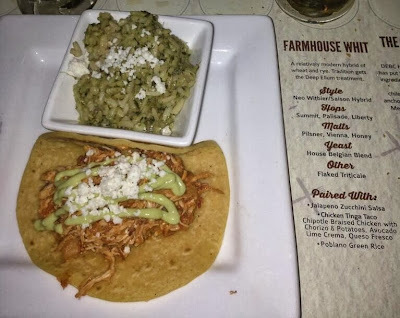 Course 4: Chicken Tinga Taco and a side of Poblano Green Rice, paired with Farmhouse Wit. Chipotle braised chicken with chorizo and potatoes, topped with lime crema and queso fresco. 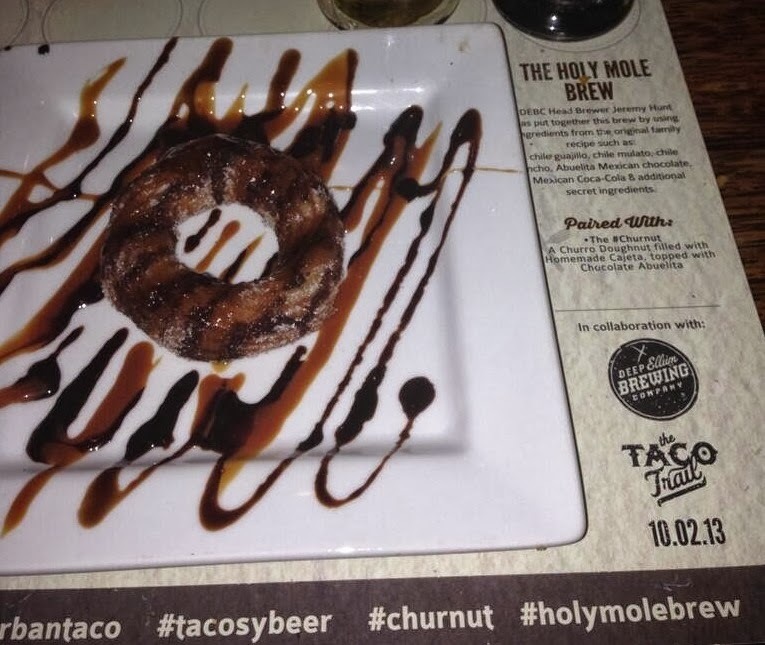 Course 5: The Churnut, paired with The Hole Mole Brew. with chocolate abuelita (melted tables of Nestlé Abuelita Mexican Chocolate drink mix). Balance and drinkability. If any two words formed a more summative description of the beer produced by the Firestone Walker Brewing Company, it's not clear what they would be. This sentiment extends not only to their award-winning line of year-round brews, but to seasonals and limited releases that many consider to be among the best beers in the world. It might be surprising that such a description would apply to brews like Parabola and Sucaba, especially considering the stylistic implications and expected potency of a barrel-aged imperial stout and barleywine. Yet, neither falls into the trap of trying to offer too much of a good thing. Instead, each represents a seamless intermingling of prominent flavors coupled with an impossibly smooth body. They aren't heavy, overly sweet or bitter, and were it not for ABVs in the lower teens, one could imagine drinking these brews well into a good night. 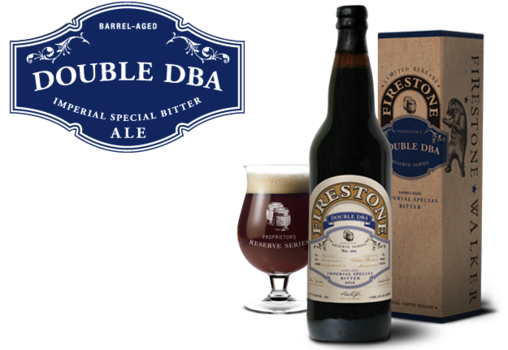 What perhaps shouldn't be surprising is that the same things can be said for the most recent release from Firestone's Proprietors Reserve Series, Double DBA. Brewed for only the second time in the brewery's history, this beer arrived in our market for the first time last month. Although labeled as an Imperial Special Bitter on the packaging, Firestone refers to this beer as a barleywine on their website. Much like Sucaba, however, it doesn't drink anything like that moniker implies. In the glass, aromas initially reveal a pleasant barrel character, with hints of liquor, charred oak and vanilla. 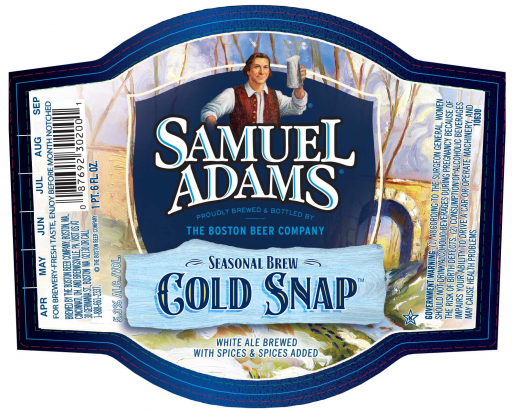 Flavors follow suit until the beer comes up a bit in temperature, at which point an intensely rich toffee character develops. The coming together is distinctive, not unlike what one imagines a bourbon-soaked Werther's candy might taste like. A hint of warmth finishes things off, but is little more than a subtle reminder of the beer's strength. Should you need further convincing of this beer's pedigree, consider that it is a version of Firestone's flagship Double Barrel Ale brewed to twice the strength, then barrel-aged. The underlying beer having taken home a gold medal from the Great American Beer Festival for "Ordinary or Special Bitter" two years running. 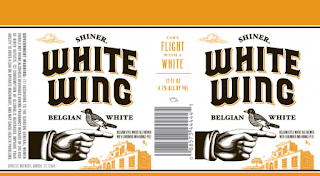 Bottles of this beer hit shelves in early September, generally selling out within hours of delivery. Kegs have appeared at festivals and at a few of the more craft beer-friendly establishments in town, and it's likely others have been tucked away for special events in the future. For now, though, you're next chance to try this beer comes later this week at the Holy Grail Pub in Plano. They'll tap a single keg of Double DBA as part of their regular Cellar Thursdays event, with the first pours happening at 6 p.m.